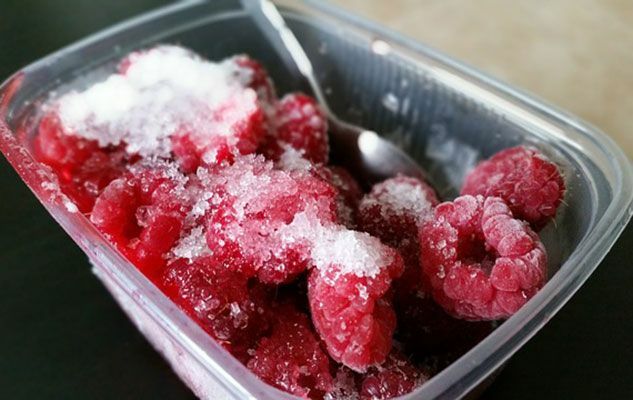 The key to defrosting foods is to keep them at a safe temperature during thawing. Indeed, as soon as food begins to defrost and becomes warmer than 4°C, bacteria – that may have been present before freezing – can begin to multiply. That’s why it’s not a good idea to keep the food on the kitchen counter, or place it in warm water, to thaw it fast. The safest way is to keep the food in the refrigerator at 4°C or below. It takes about 10 hours to defrost in the fridge for each kilogram (2.2 pounds) of weight. After that, items such as ground meat and poultry will remain safe for an additional day or two before cooking; red meat cuts can last 3 to 5 days. Fish is an exception and it should be cooked and eaten as soon as possible. This method is faster than using the refrigerator, but it requires more attention. The food must be placed in a leak-proof plastic bag. The bag should be submerged in cold tap water, changing the water every 30 minutes. Small packages of meat or poultry (about one pound/500 g) usually take an hour or less to defrost. Once the food is completely thawed, it must be cooked immediately. Use the ‘defrost’ setting of your microwave. With this method, plan to cook immediately after defrosting because some areas of the food may become warm and begin to cook during the thawing process. When there is not enough time to thaw frozen foods, as when you’re in a hurry, just remember: it is safe to cook foods from the frozen state. The cooking will take approximately 50% longer than the recommended time. However, taste-wise the final result may not be the same.